The Philippines’ government has agreed the final section of a peace deal with Muslim rebels fighting a long-running insurgency in the south of the country. It is the fourth part of a roadmap for peace with the Moro Islamic Liberation Front set out in October 2012. The accord details how the rebels will hand over their weapons in exchange for self-rule in parts of the south. The agreement, reached in Kuala Lumpur, paves the way for a final and comprehensive peace treaty. Tens of thousands of people have been killed over the past four decades of separatist fighting. The government’s chief negotiator, Miriam Coronhel Ferrer, said the agreement marked the effective end of the formal negotiations. Her counterpart from the Moro Islamic Liberation Front, Monagher Iqbal, said certain steps had to be taken: “To pave for peace, real peace in Mindanao, we have to decommission our forces and put them beyond use. 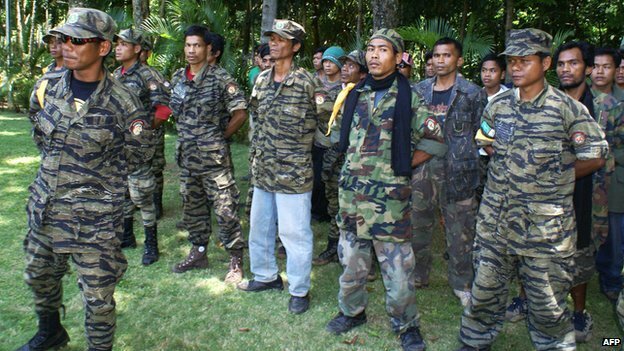 The Moro Islamic Liberation Front, created after a split with another rebel group in 1977, originally wanted an independent Muslim state, but dropped this demand. The Philippines has faced separatist movements for decades in Mindanao, where the Moro Islamic Liberation Front is based, and in Jolo, home to the radical Islamist Abu Sayyaf group, which is reputedly linked to al-Qaeda.